This remote proximity receiver allows short read ranges (3-5 inches). Mounts in a single gang box. The Remote Proximity Receiver (Model AM-RPR) is for adding localized keyless entry to a Linear radio-based access controller. 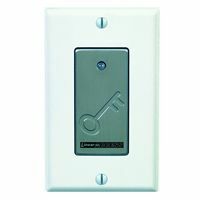 Users can gain access to a controlled entrance by triggering a transmitter within two-to-three inches of the receiver’s faceplate. Its ultra-short range allows the AM-RPR to be placed near the controlled opening, so that transmitters will not be detected by the wrong receiver. A two-color LED on the faceplate acts as a status display. The indicator lights red when the receiver is getting dc power from the Linear access controller and turns green when access is granted to a transmitter. Installation of the AM-RPR is easy. It mounts in a single-gang electrical box and connects to the system controller through a six-wire cable. Convenient, cost-effective, and reliable form of door or entrance control. 2-to-3-inch radio transmitter read range. Compatible with Linear radio-based access control systems. 2-color status LED indicates “power on” and “access granted”. Installs in a single-gang electrical box. Prevents transmitter from being detected by wrong receiver. Same as product number ACP00560.